When I first moved to Oregon I often heard local Pinot Noir wineries proclaim "we're at the same latitude as the best wine regions in France! That's why our wine is great here too!" Every weekend in the Fall, I get muddy in local bike races then go home to watch similar races taking place around Belgium, with similar weather and I've often wondered how my latitude compared with theirs. 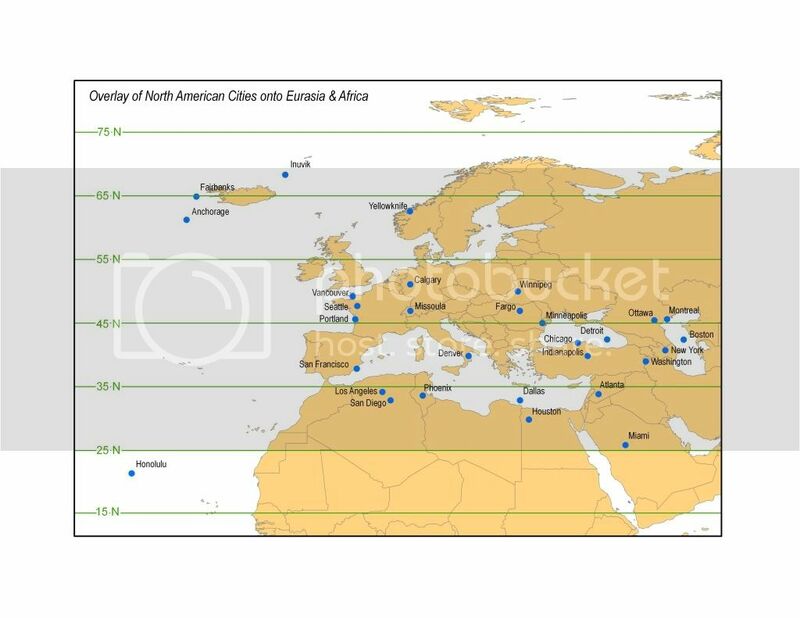 Now I know that latitude determines length of daylight pretty consistently but isn't a great comparison to weather — The west coast of the US has a cold ocean current and a jet stream to match while the Atlantic that makes up the west coasts of the European continent has a warmer ocean current and different weather to match. Still, it's interesting when making rough comparisions to know if Los Angeles is really like the south of France/Italy (it's actually in Northern Africa, latitude-wise), and I've wondered ever since a friend moved to Helsinki if that was as far north as our Alaskan cities (it is). Today I asked on Ask MetaFilter and a GIS expert member whipped up exactly the maps I envisioned. Pretty cool stuff. 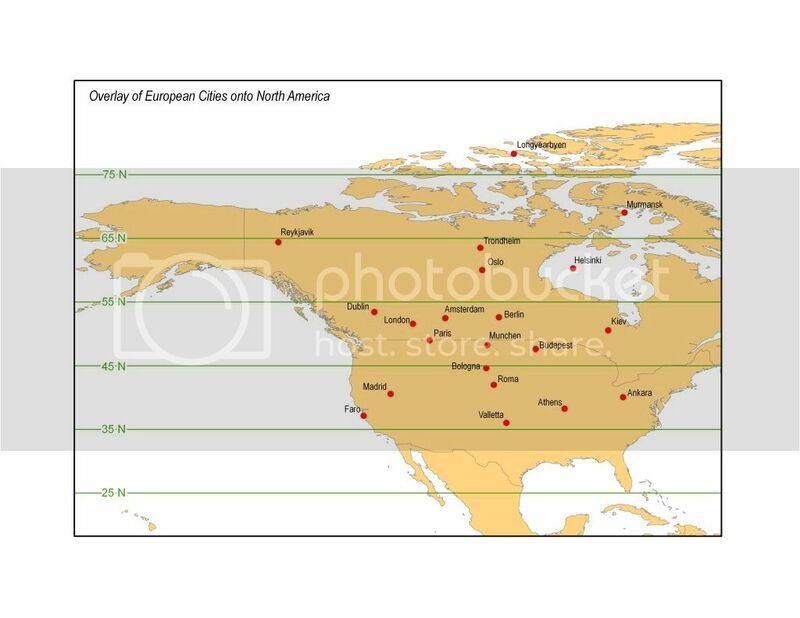 I never knew Paris, France was at a latitude farther north than Fargo, North Dakota, or that so much of Western Europe was farther north than the US-Canadian border. Wow. This is really neat. This is something that I didn’t have any real interest in until I saw it. Awesome maps. Thanks for posting it. My wife has GBM…I sit here at work sometimes and search for brain tumor sites..I used to search for long distance running sites before August 26th 2009. I guess I do know that 3 guys Solinsky, Tegencamp And bumbalough hit the “A” standard in the 5000 the other day..that’s good. She couldn’t walk, talk, control anything and I was STUNNED! Then the doctor at MD Anderson prescibed avastin and two days later, she could walk again,,BUT she is still off cognitively, yet some improvement, BUT she still can’t add 3 +2.